The following footage shows Mongolian archers in the 50's (and perhaps 60's) shooting at the Nadaam festivals, held annually in July. The Nadaam festival of Ulaan Bataar is a festival where they practice the three manly sports of Mongolia: wrestling, horse racing and archery. The particular game we see practiced here is "sur" shooting where blunt arrows are used to knock down cylinders that are made of camel-hide at approximately 80 meters. They shoot long arrows with long feathers from long-eared composite bows, much closer to Manchu bows than today's Mongolian "traditional" bow. The bow used in Nadaam today is pretty much a Manchu bow with reduced ear length to make them more efficient with lighter sports arrows. The fletchings have also became smaller over time. 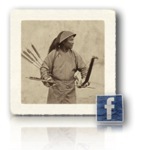 This is the only old footage known to me that shows people shooting Manchu style bows and arrows, providing us an interesting view of remnants of Qing military archery styles present among descendants of Mongolian soldiers that once served the Qing. A main distinguishing feature is pulling the bow horizontally the first few inches, with the feathers clear from the bow in order to prevent the feathers to be ruffled. I explain this technique in USING THE MANCHU THUMB RING. Differences with the Manchu style are mainly in anchor points. According to Luigi Kapaij from New York the footage includes the opening ceremony of the Nadaam Festival in Ulaanbaatar with the official shooting some bows and arrows, as is done today. He could also identify all footage to be taken at the grounds where the festival is still held today. The Mongolian narrator describes the names of the archers and their scores. According to Anar-Erdene Nergui they mention the year 1951 in the beginning of the video. Special thanks for Bede Dwyer of Australia to bringing this footage to my attention and sharing it with me. Does anybody know the source of this footage? Please DO contact me at info@manchuarchery.org. Copyright Peter Dekker of Fe Doro, 2007 - 2017, all rights reserved.